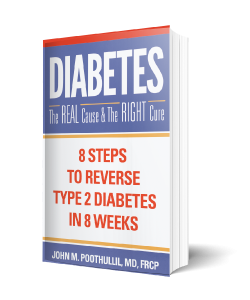 If you have Type 2 diabetes and are taking medication or injecting insulin, Diabetes: The Real Cause and the Right Cure – 8 Steps to Reverse Your Diabetes in 8 Weeks is an important book for you. You do not need to have diabetes for the rest of your life. You can lower your blood sugar permanently and reverse your diabetes using the information and recommendations in this book. After 20 years of study in the medical science of diabetes, I teach you the real cause of your high blood sugar and the ways in which you can cure this condition, eliminating it from your life. The book is full of new and valuable insights for you about how the foods you eat, particularly grains, create the conditions for high blood sugar and diabetes. Click here to buy the book. The blog this week is an excerpt from the book, as an example of new insights you may not know. If you have diabetes, this book will change your life. I hope you will buy a copy and begin reversing your diabetes today. Often people who do not want to give up grain-based foods but willing to change their eating habit ask what type of grain is better for them to consume. This is similar to the question asked by an alcohol addict whether alcohol from beer is better than that from wine or distilled spirits. As you can imagine the chemical nature of alcohol is the same whether you consume it in any of the three forms mentioned. However, the percentage can vary from 5% in beer, 10-15% in wine, and 40-55% in spirits. The glucose molecule is similar regardless of the grain it comes from. However, per 100-gram portion (about 7 tablespoons), the carbohydrate content can vary from 80% in white rice to 71% in wheat. 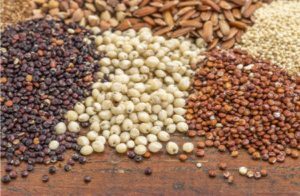 Other popular foods that people consume because they are not considered true grains can also be high in carbohydrate content per 100 grams, such as buckwheat (71%) and quinoa (64%). If this glycogen is not utilized at some time, the excess glucose will eventually fill your fat cells and cause the switch to burning fatty acids, leaving you with high blood sugar and diabetes. So as you can see, even eating quinoa and buckwheat is only slightly better than eating wheat, rice, or corn, but it is still enough to move you towards diabetes. This is why I suggest you avoid grains as much as possible, and focus your diet on fresh fruits and vegetables along with fish, meat, and dairy as you wish to lower your blood sugar and reverse your diabetes. PreviousPrevious post:To Puree or to Chew – Part 2NextNext post:How Much Food Do You Really Need?